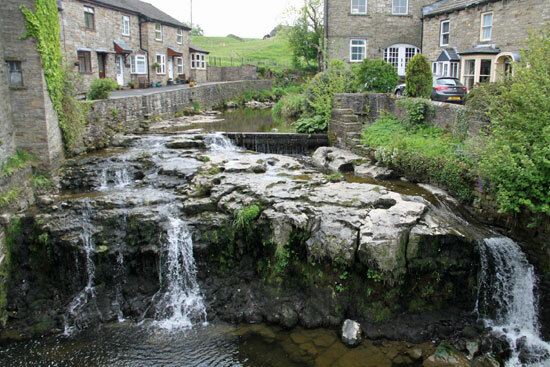 The town of Hawes is in Upper Wensleydale, centrally between Sedbergh and Leyburn high up in the Yorkshire Dales. The A684 links Hawes with the outside world. The Pennine Way long distance walk, and the Herriot Way - named after vet James Herriot who lived and worked in Wensleydale, run through it and cross at one point. Hawes is a handsome typical Yorkshire village with a rugged charm. It has a lot to offer people on holiday or for days out in the Dales, There are lots of tea shops, pubs and cafes for a meal or afternoon tea. This is still real afternoon tea country where tea is served in a china pot with scones or hearty cakes. Wensleydale cheese is also produced in this area and it's still possible to go and visit the dairy that produces it in Hawes for a 'cheese experience tour' like 'Wallace and Grommit'. Like many other Yorkshire Dales towns it has a preserved cobbled area with various shops to browse in. An outdoor and indoor market is held on Tuesdays. Herriot's Gallery has a coffee shop with WiFi so that you can catch up on those emails even when on holiday. Mountain bike hire is available locally to enable you to explore this Hawes and surrounding countryside via pedal power. The River Ure passes near Hawes with lovely places for picnics on the riverbank during the summer. Hawes Carft Centre to watch pottery being made and various other crafts. Everyone stops on the bridge to admire the the river Gayle Beck tumbling down a series of rocky levels.